Composed and commissioned by the Monash Art Ensemble in 2013, Aerea reflects on that slight sense of déjà vu you might feel while looking down from an aeroplane window which comes in part from the shifting correspondences between the world below and your own. You start to notice relationships in abstract things that recur, not only from one shape to another, but also within the same shape. Aerea takes this idea of shifting entities as a metaphor to create dramatic twists and turns of movement. As the music unfolds from one passage to the next, quasi-improvised figures contrast with highly organized rhythmic structures. As ideas echo from one instrument to another, they hark back to the hocket-like motifs prevalent in medieval polyphonic practice where single notes, parts and melodic patterns alternate to create rhythmic intensity and momentum, all working within a larger framework that is guided by a strong directive throughout the piece. Instrumentation: Bass clarinet, 2 soprano saxophones, alto saxophone, tenor saxophone, baritone saxophone, trumpet in C, trumpet in B flat, trombone, drum kit, percussion, piano/celesta, guitar, violin, double bass. 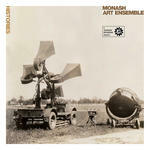 Commission note: Commissioned for Monash Art Ensemble with funds provided by Monash Academy of Performing Arts, Monash University. Funk, Contemporary Jazz, twentieth century classical music - in particular Lutoslawski. 17 Aug 13: Sir Zelman Cowen School of Music, Monash University, Melbourne. Featuring Monash Art Ensemble.